The other day I noticed amongst my small dvd collection that Interview With The Vampire was sitting there, still unwatched from when I borrowed it from Jerry quite some time ago - probably a few months at least. I remember sincerely wanting to watch it again at the time, having not seen it since back when I used to have it on video, but somehow it seemed always skipped over in favour of some other movie I'd seen less often. That night, for some reason, I was only able to watch half of it, though I planned to finish the rest very soon so that I could give it back with many apologies for the delay. Just started watching Indiana Jones and the Last Crusade tonight - the only one I've got on dvd - when Chantal mentioned that she'd only just seen that one a little while ago. 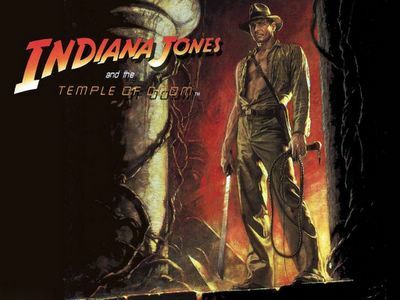 I kind of felt like watching The Temple of Doom anyway, which is actually my personal favourite of the trilogy, so I was considering a trip to the video store, but then remembered that the Indiana Jones box set was a part of Jerry's extensive dvd library. Even though I don't really like to do a "double borrow" from people, I called him up anyway. Turns out his sister had just been over to borrow some dvds as well and he was feeling a bit like a "drive through dvd rental store". I felt a little guilty as I was driving away from his place just down the road. I'll try to make sure for a prompt return. I'm not sure exactly why I prefer Indiana Jones and The Temple of Doom over the other two. It does have a rather different style to the first and third instalments I guess, less following the clues to hidden archaeological treasure and all that, but there seems to be something else that makes this film stand out in my head as slightly more enjoyable than the others. Even so, I've read on some other sites that many consider The Temple of Doom to be the weakest of three. What is it that lets one particular movie stand out inside the mind as somehow superior to others? Is it culturally related, based on past experiences? How is it that opinions change over time? The hundred years war of the mind, good versus evil, interchangeable terms really, advocated by the victor. Which one is your favourite? Favourite what? Indiana Jones movie? Thats an easy question to answer - none, I hate all three equally. If you meant a favourite film in general - it's too hard for me to pick just one! nice blog. could u add my blog?